Confidencia, a photo by jankor on Flickr. Easter Bonnet Parade 2013 on New York's 5th Ave. See the whole set on Flickr, to enjoy the titles, or go straight ahead and enjoy them in a slide show. The total bonfire of vanities - for more than 140 years New Yorkers took to 5th Ave and went strolling between 49th St and 57th St. The tradition is quite alive since the 1870s, but the peak with more than a million participants in 1947 is definitely history. Unlike the St. Patrick's Day Parade, the Steuben Parade or the Columbus Day Parade, this is not a proper parade - there are no floats, no music, no organized show. 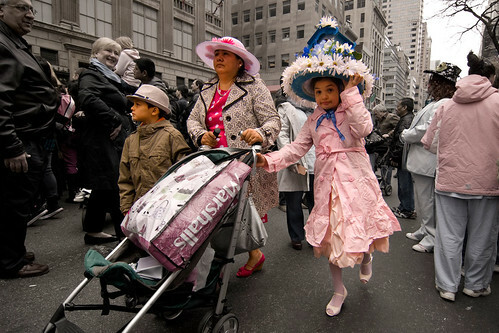 The mood is festive, people show off their fanciful costumes and themselves - and enjoy like real New Yorkers the Easter Sunday. More facts at Wikipedia.